Federal prosecutors are urging the federal judge overseeing PG&E's criminal probation to reconsider a proposed order that would require the beleaguered utility to conduct a sweeping reinspection of its power facilities to ensure they are wildfire-safe. In a separate filing, PG&E argued against the proposed program of inspections as impossibly expensive and labor-intensive, adding that the order would trample upon federal and state laws and regulations. U.S. District Court Judge William Alsup earlier this month proposed expanding PG&E's five-year probation for a 2016 pipeline safety conviction to include immediate new inspections over the company's entire service area. One of Alsup's new conditions of probation would also prohibit the utility from operating parts of its system during periods of extreme fire danger unless they are freshly certified as safe. Alsup wrote that his goal is "to reduce to zero the number of wildfires caused by PG&E during the 2019 wildfire season." Prosecutors with the U.S. Attorney's Office in San Francisco and PG&E were both required to respond by noon Wednesday, ahead of a scheduled hearing next week at which the judge proposed to impose the new conditions. The federal prosecutors noted in their seven-page filing that, based on 9th U.S. Circuit Court of Appeals rulings, lower courts are required to find sufficient grounds in the court record to impose special conditions of probation and that the conditions "be no broader than reasonably necessary." "The government does not believe the record supports imposition of the proposed conditions as they are currently drafted," the prosecutors said. They added that Alsup's order risks interfering with the complex scheme of federal and state regulations -- and regulatory agencies -- that already oversee PG&E and other utilities. Instead, they urged Alsup to refer his conditions of probation to a court-appointed monitor who has been working with PG&E since its 2016 conviction. The monitor -- Mark Filip, a retired federal judge and Chicago-based lawyer -- has assembled a team that was originally charged with overseeing how PG&E operates its natural-gas transmission system and safety culture. The monitor's purview was expanded after the October 2017 North Bay Fires to include some of PG&E's electrical operations. The monitor has agreed with the company not to review the cause of the 2017 fires and instead to focus on the company's vegetation management practices and other "forward-looking" issues. The U.S. Attorney's Office urged Alsup to direct "the monitor (to) review the court’s proposed probation conditions, consult with relevant agencies, and draft a final set of workable probation conditions that achieve the court’s goals while minimizing enforcement challenges." In its own filing Wednesday, PG&E argued that Alsup's proposed probation conditions would conflict with existing federal and state laws and regulations. The utility also said the inspections and operating conditions Alsup proposes are "technically and operationally infeasible." 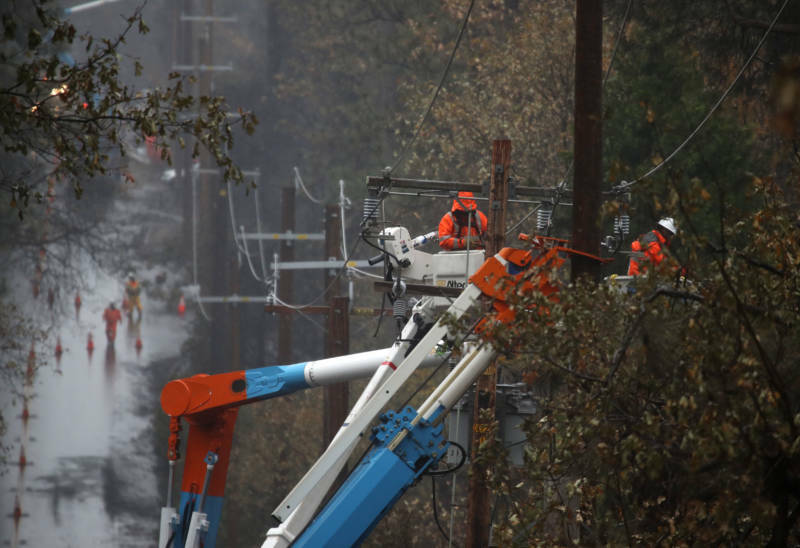 "PG&E would be required within less than five months to remove or trim trees and branches that could bend, break or fall into powerlines, poles or electric equipment in high-wind conditions," the company's lawyers wrote. "PG&E estimates that more than 100 million trees have the potential to grow or fall into overhead power lines," the filing said. "To reduce to zero the risk that any of those trees contact electrical equipment, PG&E would have to remove all of them, and that does not include the innumerable branches from trees further away from powerlines that also may potentially fall within the scope" of Alsup's probation proposal. PG&E says the vast scope of the judge's proposal -- and his suggested deadline of having work completed by or during the course of a fire season beginning in June -- would require 650,000 workers and could cost $75 billion to $150 billion. The company said that at the lower end of that estimate, the order could result in a one-year fivefold increase in customers' bills. PG&E, which is facing hundreds of lawsuits arising from the 2017 and 2018 wildfires, announced several days after Alsup issued his proposed order that it would file for Chapter 11 bankruptcy protection at the end of January. The company says it faces at least $30 billion in potential liabilities arising from the fires -- though some shareholders and others have challenged the notion that the company faces insolvency and argued that a bankruptcy filing would be premature.